Swans Stats: Would you work for the Swans for free? 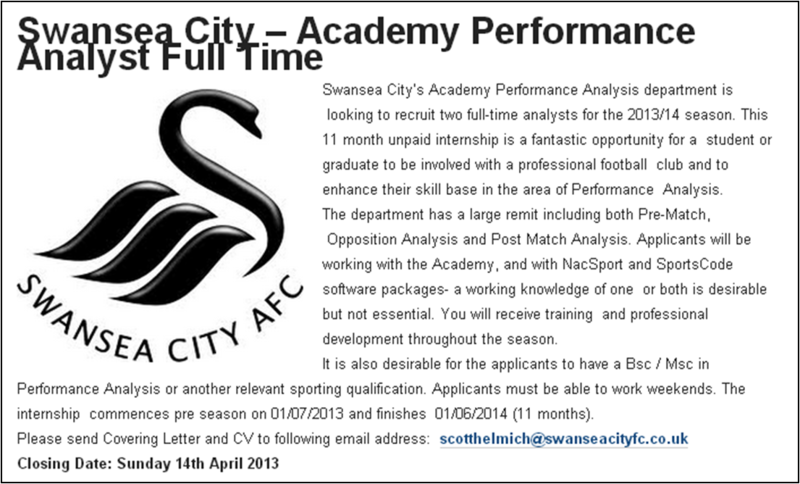 Would you work for the Swans for free? Over the last couple of days there's been a fair amount of attention on the practice of a number of Premier League clubs (including Swansea) using unpaid Graduate interns on long term (usually 11 month) positions. As someone who is interested in performance analysis but not involved in the industry I've seen numerous jobs posted (The Video Analyst does a good job of collating them) and it's interesting to note that the publicly funded UK Sport website has taken a number of these roles down since this issue broke. These roles follow similar lines where they are asking for someone ideally with a postgraduate qualification in Performance Analysis to work for nothing (to be fair to West Brom their job offers at least some sort of salary at £8k). I'd imagine that working among the backroom staff for a football club, although being an incredible experience would pretty much take over your life with evenings and weekends taking a battering (not just because you often had to but because you wanted to). The main roles that have attracted criticism are from Reading, Wigan and Swansea. Of the 3, the Reading one is arguably the most ethically dubious as it involves working with the First Team so has the most bearing on the overall success of the club and where they are pretty much looking for an analyst who already knows what they are doing, the Wigan and Swansea roles are working at Academy level so there is less of the juxtaposition that has been presented by the media of unpaid serfs rubbing shoulders with multi-millionaires. In relation to the Swansea role there was a ripple of discontent on Twitter about it being unpaid when the role was first advertised a few weeks ago but it took the highlighting of the Reading role to bring the issue mainstream. If you put the legal and ethical considerations to one side, the opportunity to work at a Premier League club as a Performance Analyst is a fantastic opportunity and could save years of toiling about in lower leagues where they have a fraction of the facilities. Put bluntly if the club were charging you £10k to do the work I'd still argue it would be a worthwhile investment. This ultimately is the key point, it's a great job with great prospects but is only really applicable to someone with supportive parents or willing to get even further into debt. It means you get the best person who can afford to work for free for a year, not necessarily the best person for the job. Anyone who is interested enough in this field to have taken an MSc in it is not going to suddenly decide they want to work in Insurance or Marketing, they'll take anything they can to get a foot on the ladder and people can say 'It's Supply and Demand' or 'It's what everyone else does' but if you are getting someone to produce work that is of value over as long a period as 11 months without paying them then that has to be considered unfair. Swansea are seen as the 'Mother Teresa' of football clubs with the Trust on the board and sensible financial planning and as a result the club tends to get more criticism for anything it does that would be considered standard behaviour elsewhere. I don't agree with bringing up the issue of the recent dividend for the Directors, that for me was fair reward for the time and money those people have invested in the club. Minimum Wage works at around £12k a year, if the person who takes the role isn't providing the equivalent value or more to the club then why have the you got the post? If they are, then why aren't you paying them?